by Allen B. Downey, published by O'Reilly Media. The second edition of this book is available now. We recommend you switch to the new (and improved) version! Order Think Stats from Amazon.com . Code examples and solutions are available from this zip file. Download data files for use with the book. 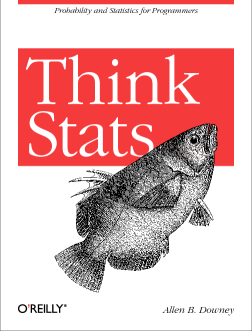 Most introductory books don't cover Bayesian statistics, but Think Stats is based on the idea that Bayesian methods are too important to postpone. By taking advantage of the PMF and CDF libraries, it is possible for beginners to learn the concepts and solve challenging problems. This book is under the Creative Commons Attribution-NonCommercial 3.0 Unported License, which means that you are free to copy, distribute, and modify it, as long as you attribute the work and don't use it for commercial purposes. Other Free Books by Allen Downey are available from Green Tea Press.